I've been thinking for a while I should put a little birthday cake montage together in this here space. How bout that? Shortly after college I had a job at a local burger and ice cream joint (quaint, right?). I was hired primarily to do the ice cream cakes. I had no training but a girl who was few years older than me gave me a few hours worth of lessons and then I was on my own. I spent most of my shift scooping ice cream and filling orders of fries but the part I looked forward to most was making and decorating those cakes (and frying random things in the fryer. That was fun, too. Oh, and making crazy fun delicious sundaes to eat. Also fun.). Looking back, out of the many part time jobs I had, this one ranks as one of my favorites. Somewhere along the line I also decided to banish synthetic food dyes from my children's diet because I like them to eat, you know, food. (Sometimes I can be a bit slow, eh?) It makes the cake making a bit more challenging but also more fun. I'll try to let you know in the pics when I started to go all crunchy-like... And I apologize for some of the crummy pictures. Many were taken long before blogging days and I'm certainly not a stellar photographer anyhow. 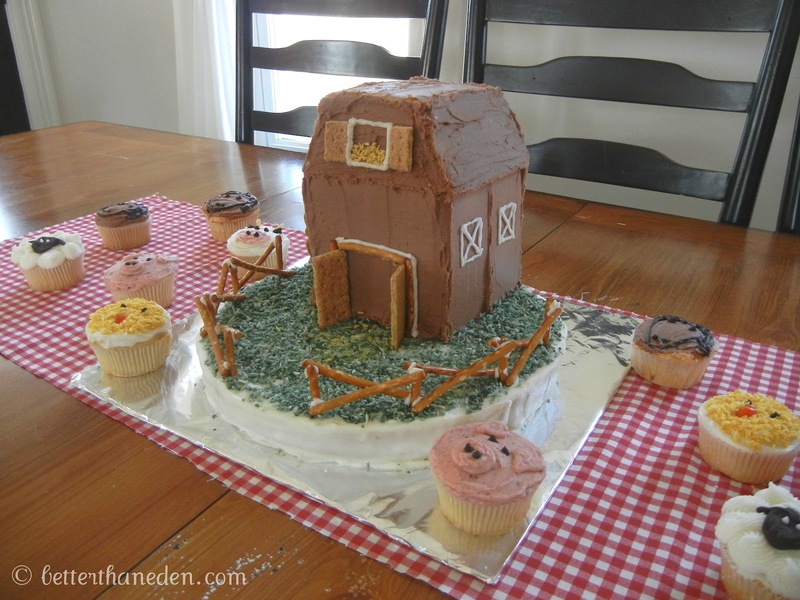 Oh, and if you are inspired to use one of these cake ideas, please leave me a comment and let me know! I'd love to hear about it! Oh, I know, it's boring but it was my first one. And one year olds don't have very strong preferences, you know. 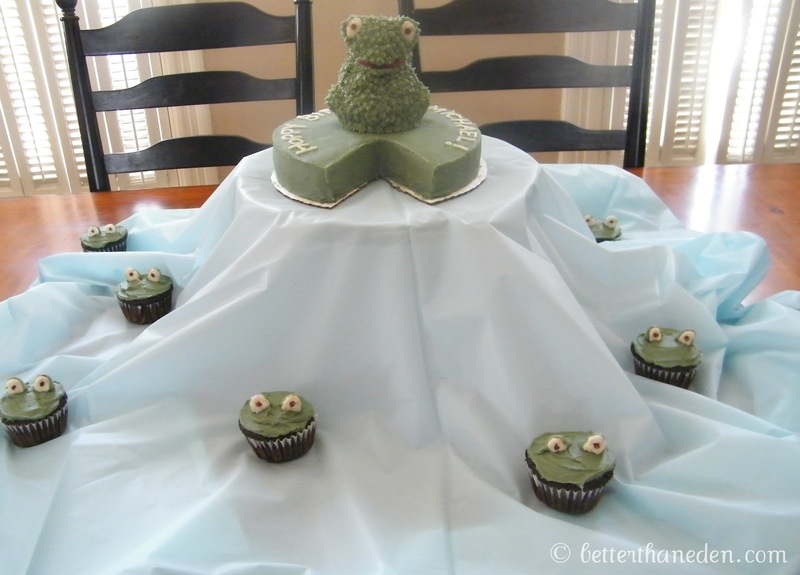 In fact, most of my babes were sort of weirded out by the cake experience. John Paul's 2nd birthday (because obviously I am used to talking to small children and need to point that out) - The toolbox cake. 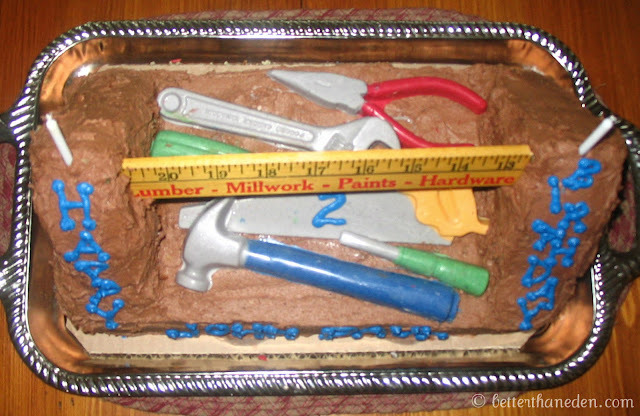 The tools were made with white chocolate and a mold I bought from a bakery supply store. 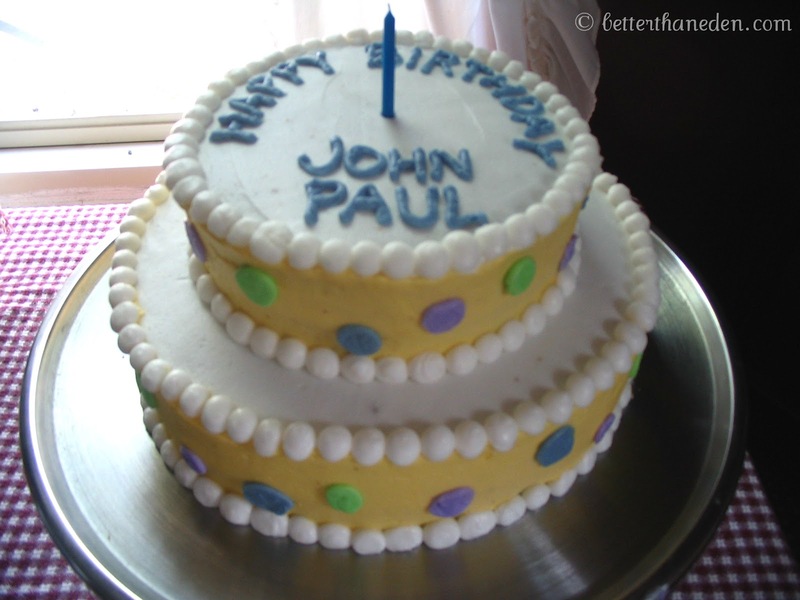 John Paul's 3rd Birthday - I think I could actually make this using natural dyes now. 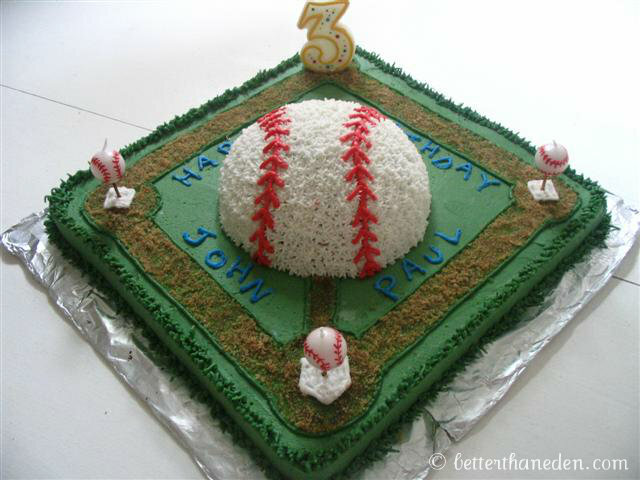 The baseball was a ball cake pan sold by Wilton and the 'dirt' is brown sugar. Our Michael Monkey turns 1! I like this one. Somewhere around this time I realized that you can accessorize a cake without the accessories actually being cake. The bananas and leaves are just construction paper. And no dyes! Just two varying degrees of chocolate. Though I think that was mostly because almost all of our things were in boxes at that point. A week after this we moved several states away. Honestly, I'm not a big fan of this one. It was HARD to do and didn't turn out as well as I'd hoped. But still cool. 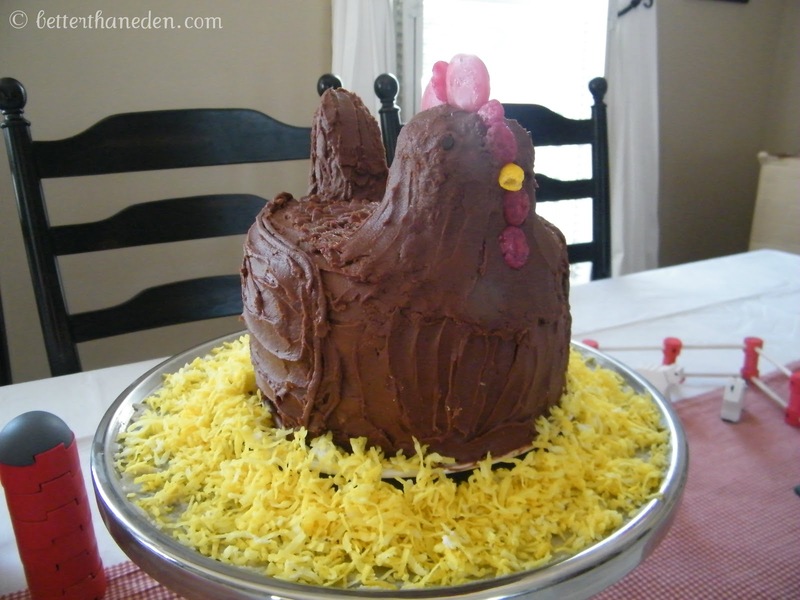 And still better than brownies in a baking dish. 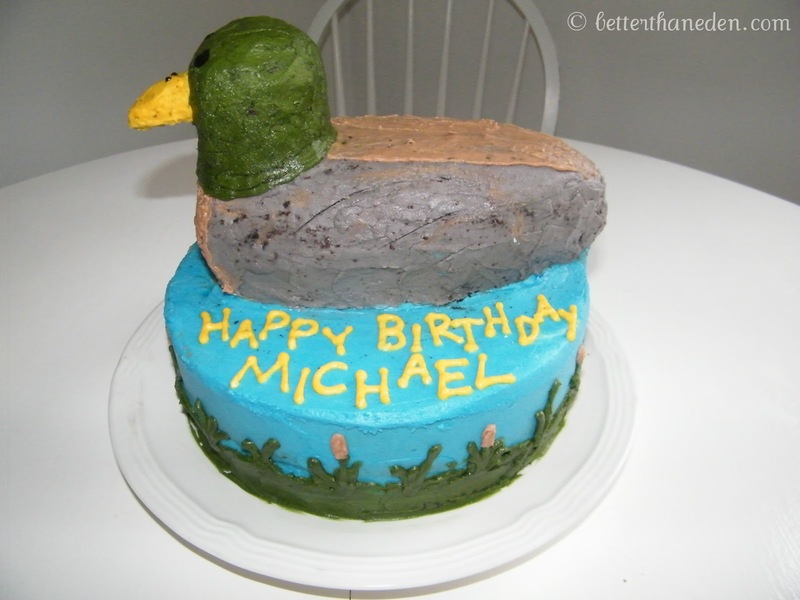 Michael's 2nd Birthday - A cute little rubber ducky was not sufficient. He wanted a duck like the ones at the park. We lived near a park at the time. And I can't say no. Well, back then I couldn't. I was so pregnant and so tired at the time, I can practically feel it when I look at this cake. 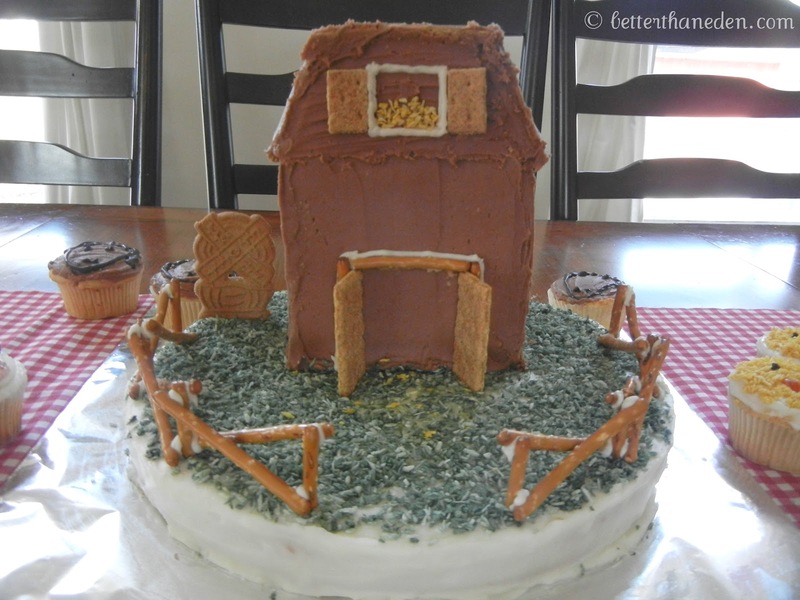 So, no, it is not the best...but it was made with love. And possibly some colorful language. 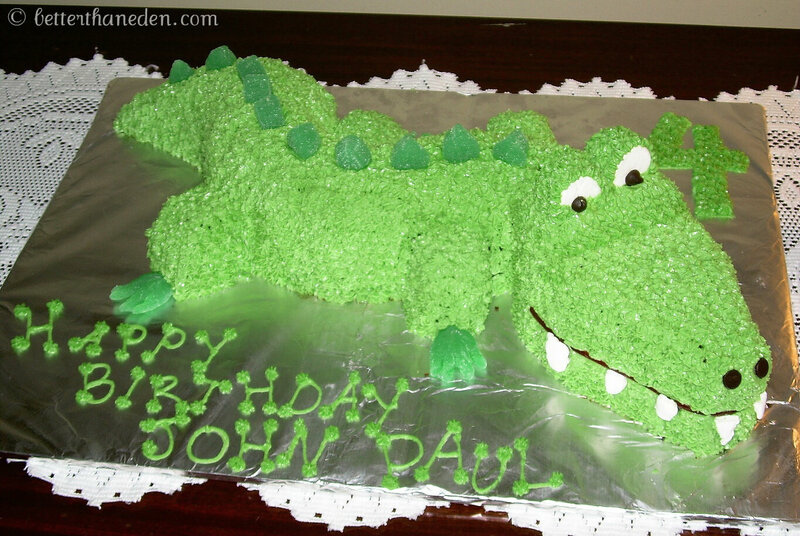 John Paul marked his 5th birthday with a tribute to his love of knights and castles. Clever use of ice cream cones both inside and out. And I am particularly proud of my little alligators in the moat. I made a bunch of little froglets to peek out of the water as well. How cute are they? 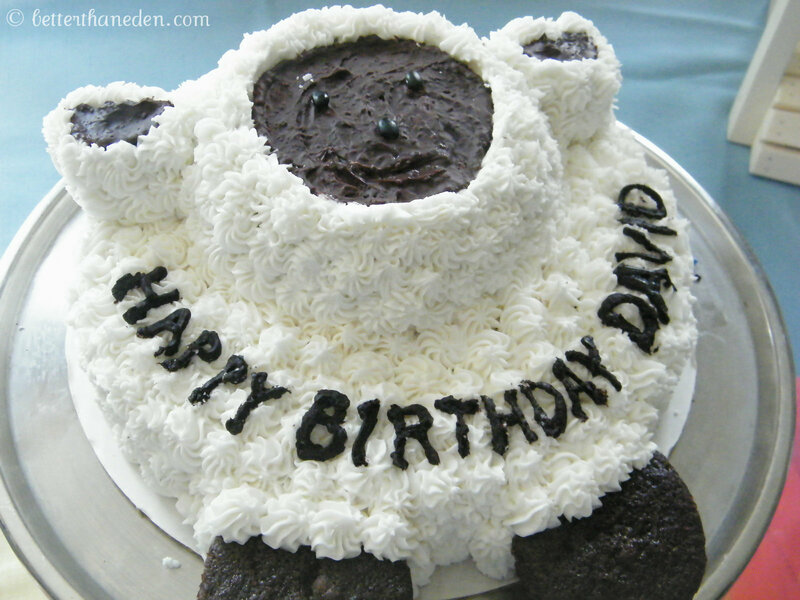 David's 1st Birthday! Thought the lamb idea would be cute to go along with his name. The feet are unfrosted cupcakes. Wording and face are melted chocolate chips. Overmelted...you can tell by how poorly the letters came out but if I remember correctly I had nothing left to try again :) The eyes and nose are black beans. Yes. Jelly beans would make much more sense, no? But a certain someone did not have jelly beans at the ready. 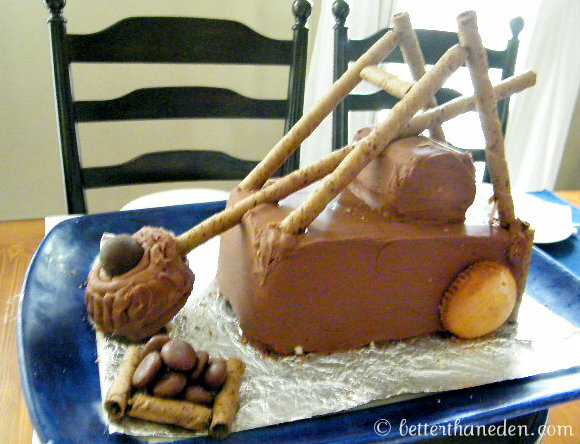 John Paul turns 6 and requests a 'catapult cake.' Well, here you go. Honestly, one of the easiest ones to do (and obviously easier than learning to focus a camera). 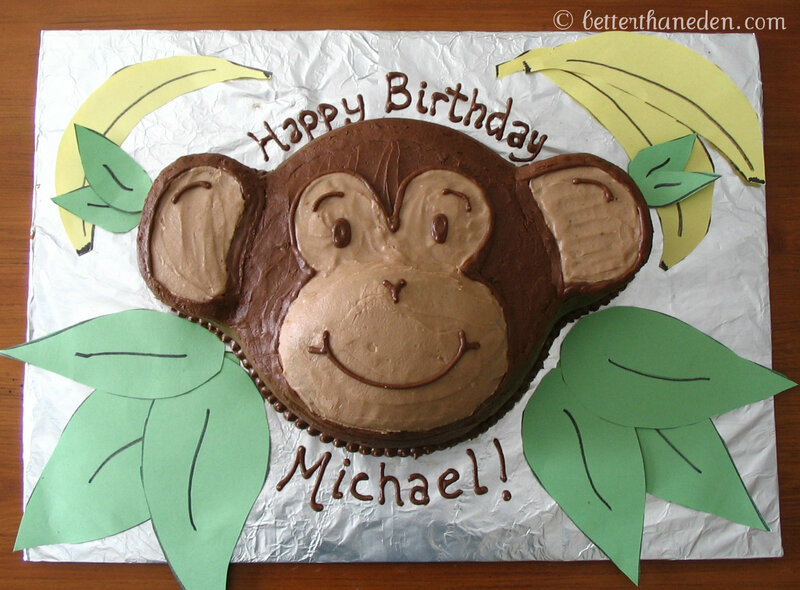 Michael's still got a streak going of animal-themed cakes. His 4th birthday request? 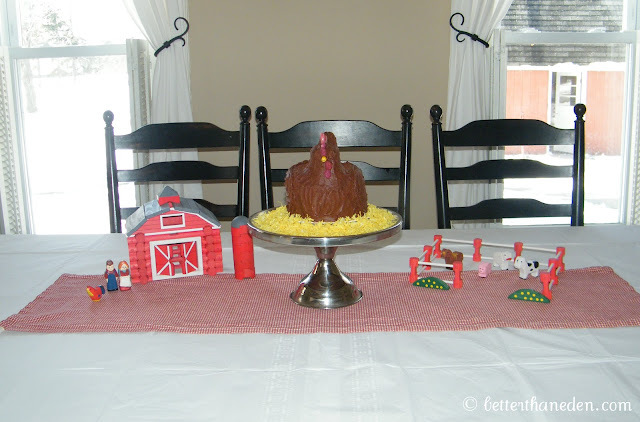 A chicken. Oooh. This is another one of those pregnant, exhausted, and why in the heck did I start this tradition? cakes. 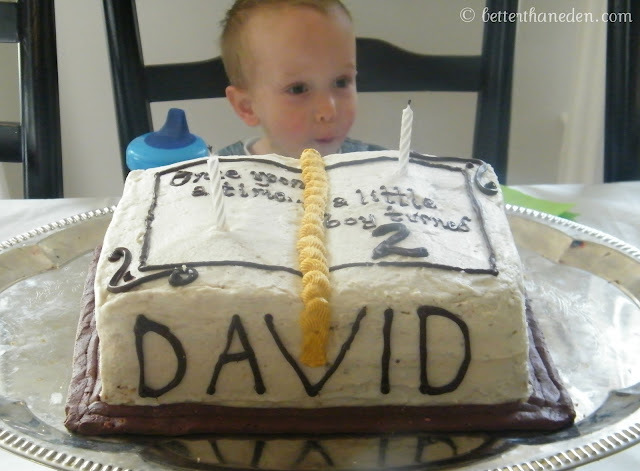 David's 2nd Birthday. Also a few days after we got home from a trip. From the time he was a baby, David has been our little bookworm. So a book it was. 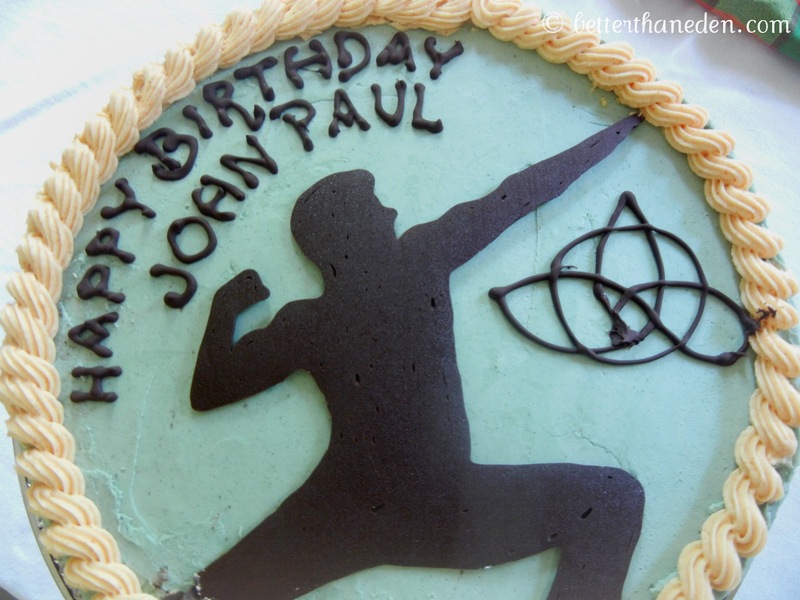 I know, it sort of looks like a graduation cake or something, doesn't it? Cut me some slack. I was growing a person. 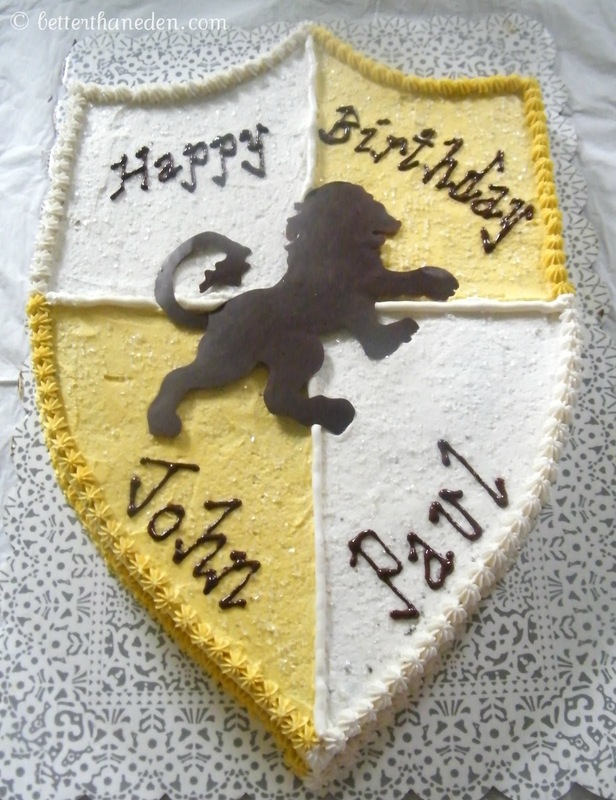 The Narnia shield for John Paul's 7th. I have a super awesome trick to get a design drawn in chocolate like that. 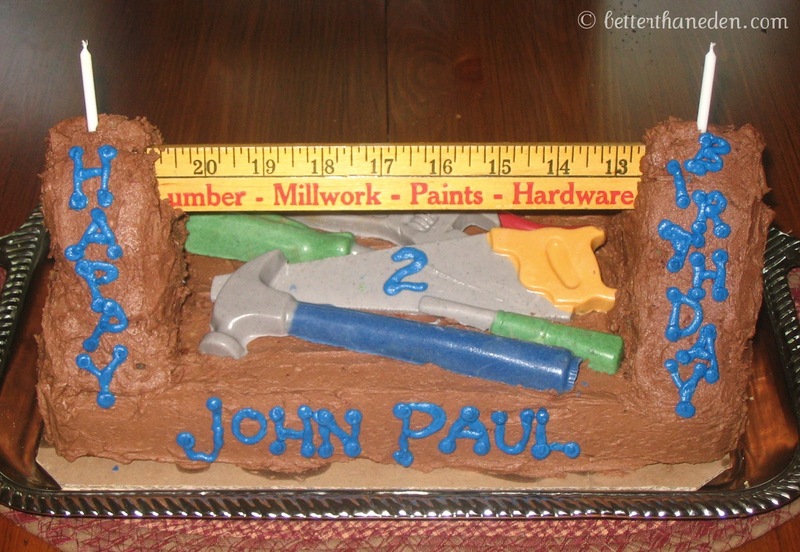 This cake was made for my dad's birthday that we celebrated with most of the grandkids at our home this past year. 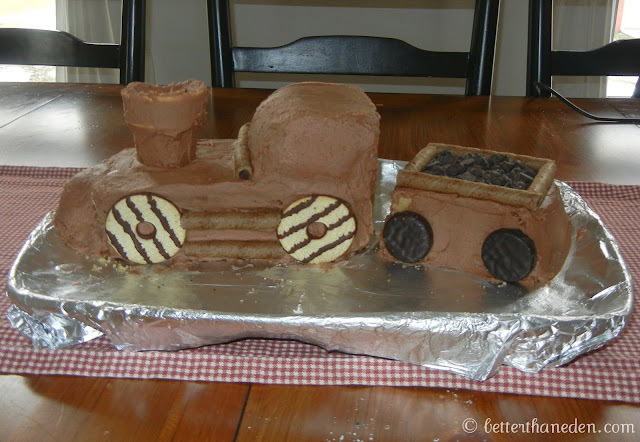 He's always loved trains and I've always wanted to try a train cake. Loaf pans, cookies, an ice cream cone, chocolate chips... Simple, but it works! 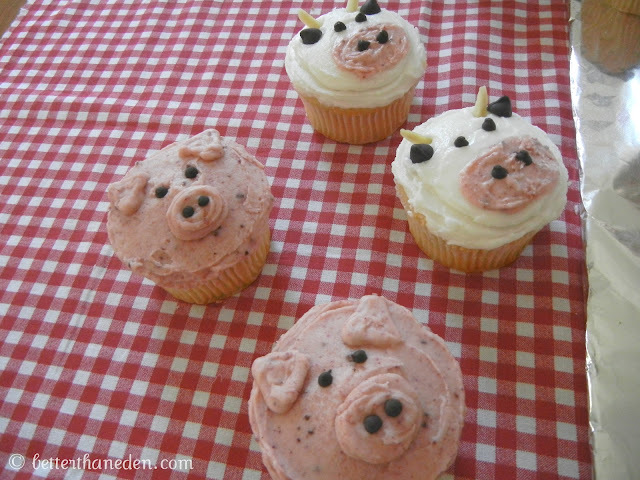 ...and cows and pigs (the pink is made with beet powder). Oh, I was so happy when David said he wanted a rainbow cake for his 3rd birthday! So simple to do yet so cool looking! Bonus points in that I repurposed this cake from the leftovers of John Paul's First Holy Communion cake. And he even got his name spelled out on front. That was the extent of my elaboration. So, there they are! As hard as it sometimes is to do, I love that I can look back on it as a labor of love and it is worth it. I hope my sweet boys will have wonderful memories of their special days and cakes and know how much their mama celebrates them. 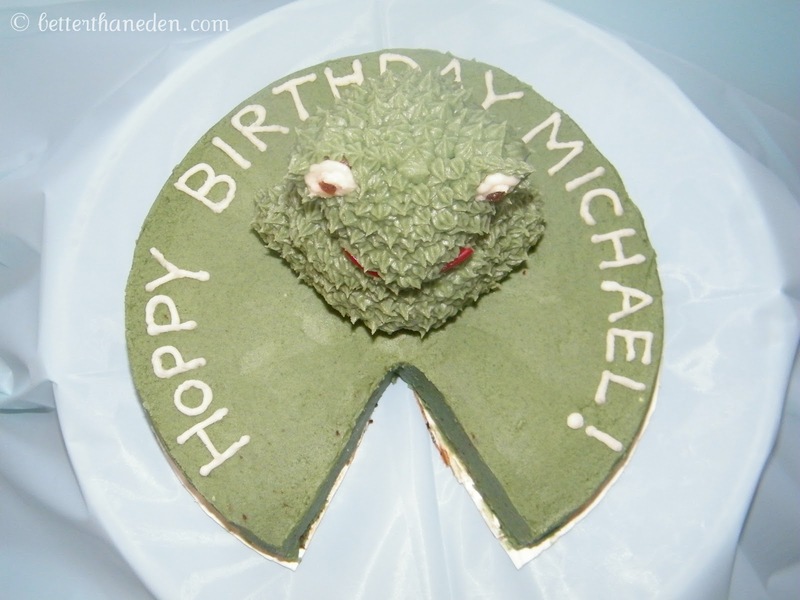 And also hope they forgive me for the seaweed. You pretty much just flew into rock-star status, as far as I'm concerned. I think I've made approximately five cakes in my life, they were all rectangular, all served right from the pan, and all slathered in food dye. Okay, no. 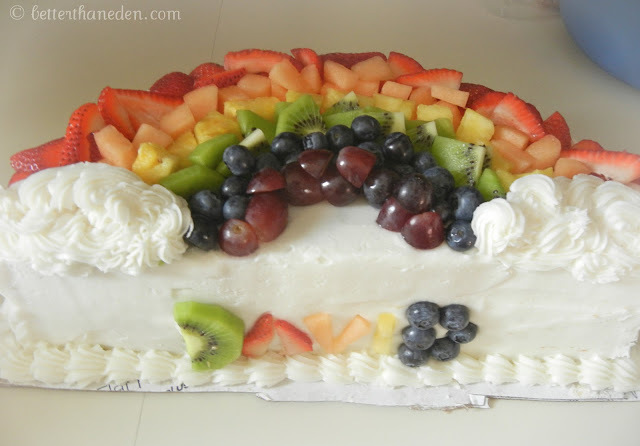 Prim's first cake was frosted in a dried-apricot/apple juice spread because I was totally into healthy crunchy living back then. but then I got old and tired and now I just use food coloring. 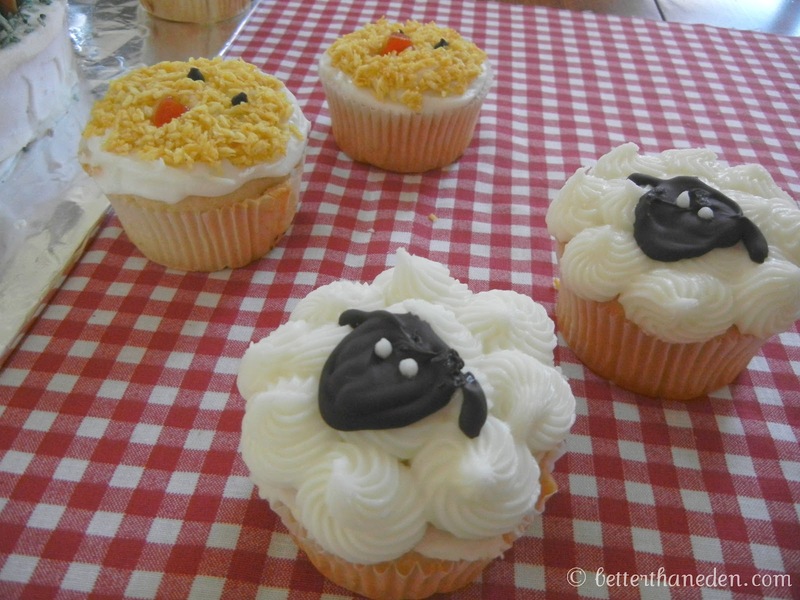 Actually, now I just buy cakes. Um, I'm pretty sure you might be younger than me but if not, we can be little old ladies together and eat brownies. Is it weird that I don't even really like cake? 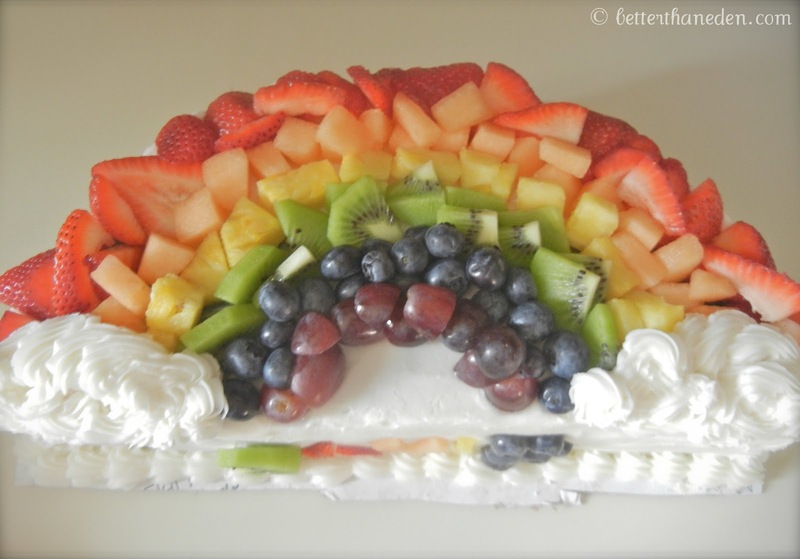 Unless of course, it's ice cream cake. Totally different category. These are awesome - you are awesome! 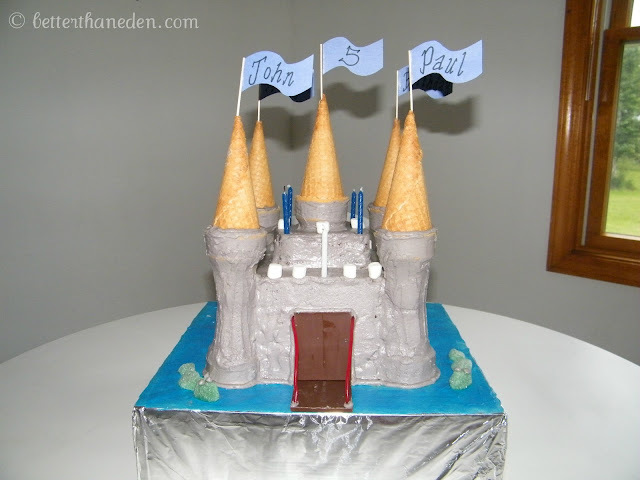 When I saw your castle cake I laughed because of how my attempt at a castle cake last year turned out. It looks like a lot of work....I like that my girls started making their own (with a little help from mama). That way when they turn out looking like a 5 year old made it, I can say they actually did! I was wondering how you did the food-dye all natural. 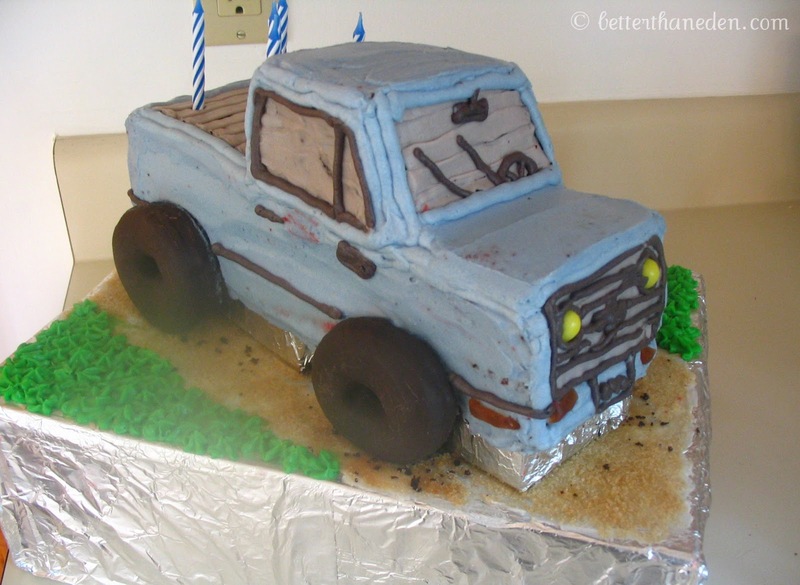 I'd love to see a list of colors and the natural item to color the frosting. If you put enough sugar in you can't taste it, right? ;) Also, I love the brillant colors that are in nature. Did you know that there are purple fingerling potatoes, so that might work for purple.